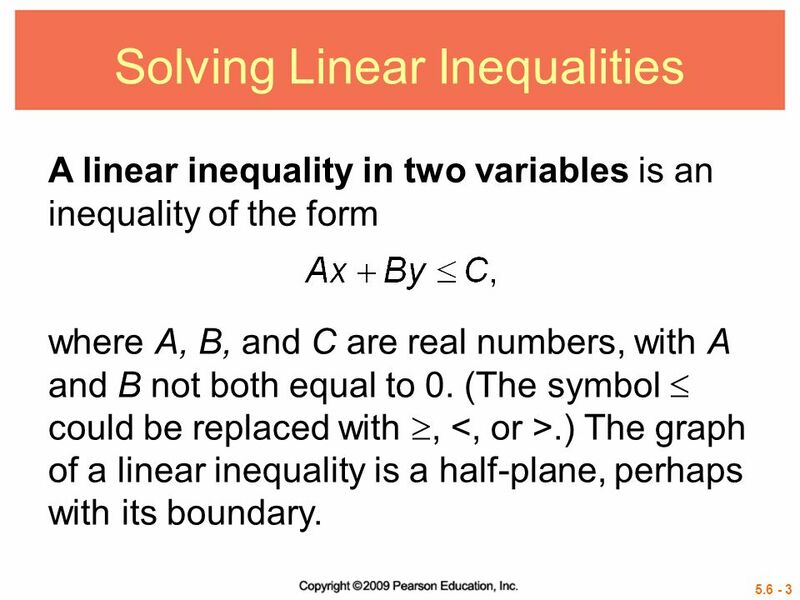 A linear inequality in two variables is an inequality of the form where A, B, and C are real numbers, with A and B not both equal to 0. (The symbol  could be replaced with , <, or >.) 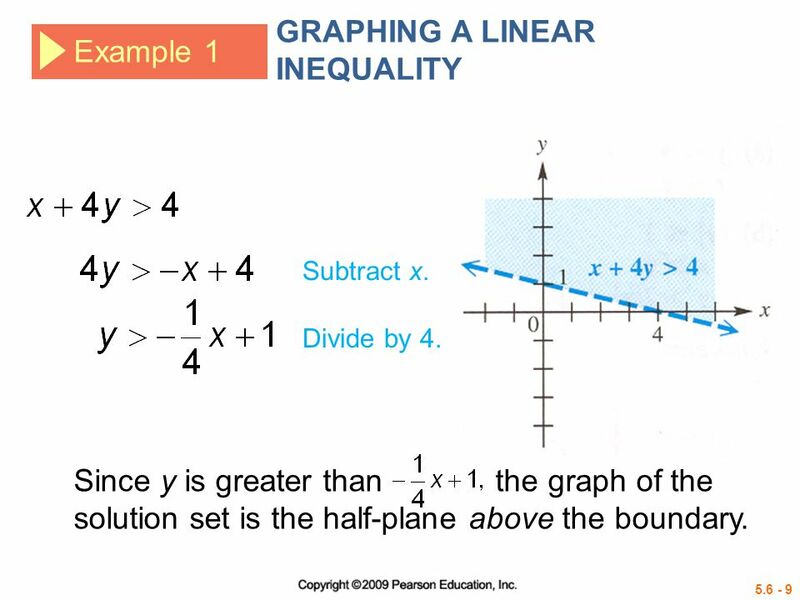 The graph of a linear inequality is a half-plane, perhaps with its boundary. 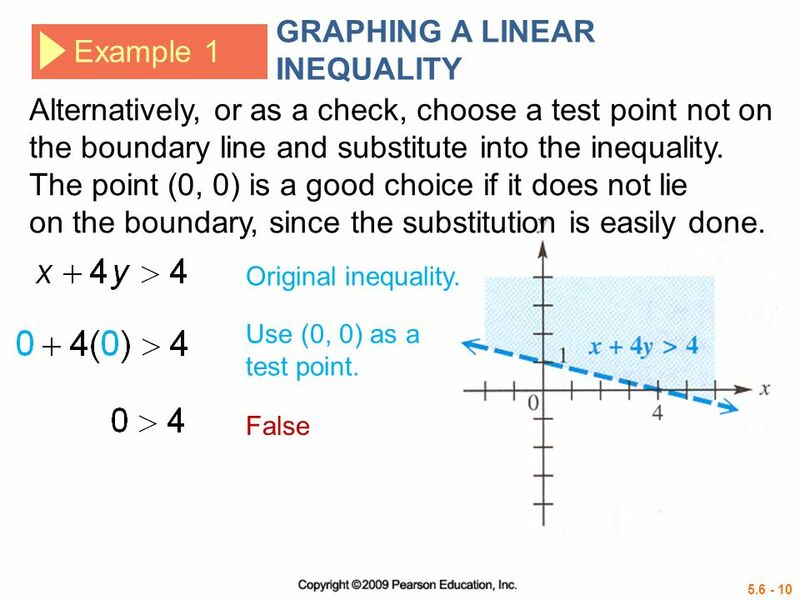 For example, to graph the linear inequality first graph the boundary. Since the points of the line satisfy the equation, this line is part of the solution set. 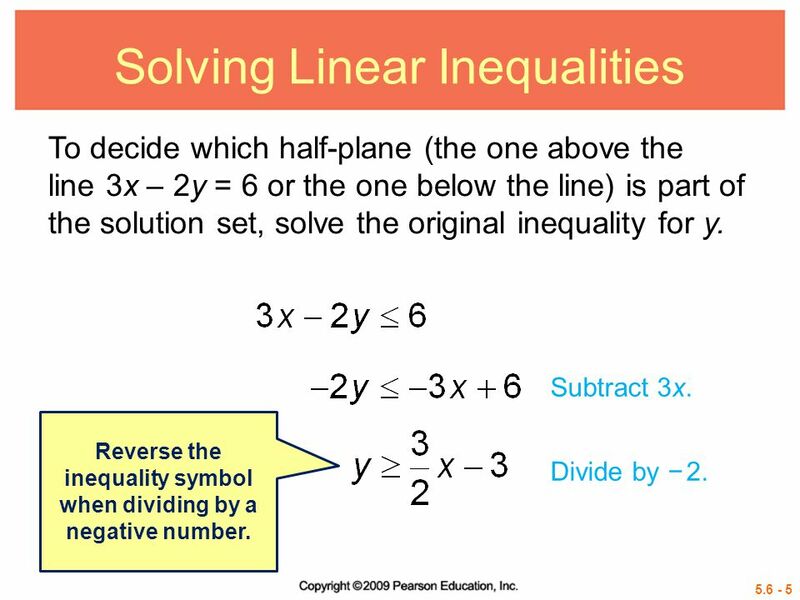 To decide which half-plane (the one above the line 3x – 2y = 6 or the one below the line) is part of the solution set, solve the original inequality for y. Subtract 3x. 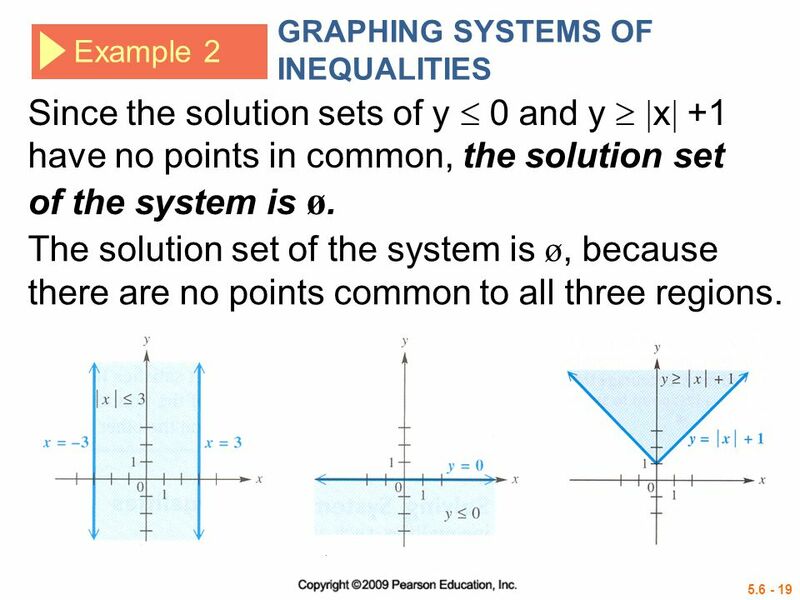 Reverse the inequality symbol when dividing by a negative number. Divide by − 2. For a particular value of x, the inequality will be satisfied by all values of y that are greater than or equal to Thus, the solution set contains the half-plane above the line. 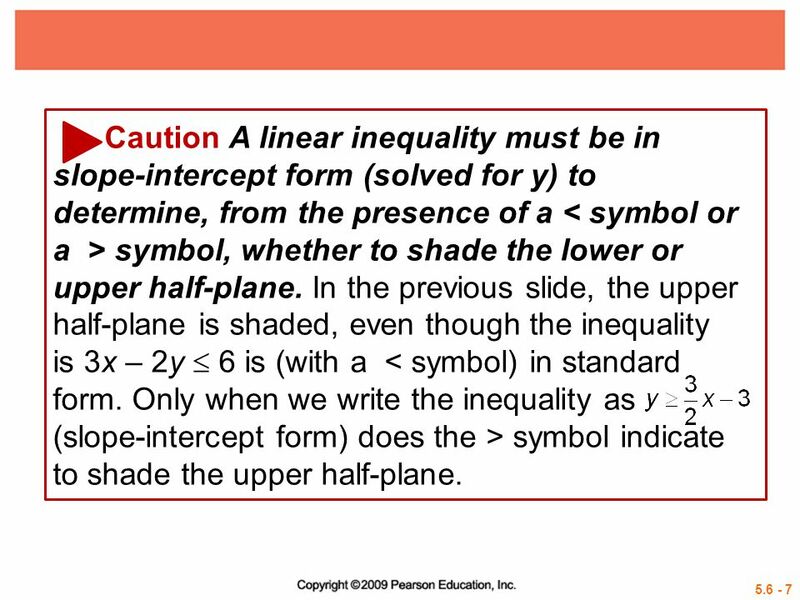 7 Caution A linear inequality must be in slope-intercept form (solved for y) to determine, from the presence of a < symbol or a > symbol, whether to shade the lower or upper half-plane. In the previous slide, the upper half-plane is shaded, even though the inequality is 3x – 2y  6 is (with a < symbol) in standard form. Only when we write the inequality as (slope-intercept form) does the > symbol indicate to shade the upper half-plane. 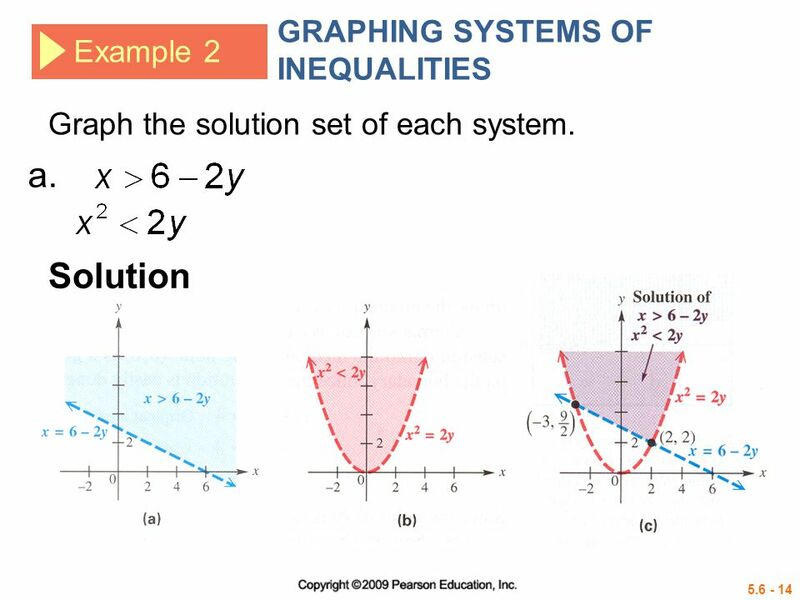 GRAPHING A LINEAR INEQUALITY Example 1 Graph x + 4y > 4. Solution The boundary of the graph is the straight line x + 4y = 4. Since points on this line do not satisfy x + 4y > 4, it is customary to make the line dashed. To decide which half-plane represents the solution set, solve for y.
Subtract x. Divide by 4. Since y is greater than the graph of the solution set is the half-plane above the boundary. For a function , the graph of y < (x) consists of all the points that are below the graph of y = (x); the graph of y > (x) consists of all the points that are above the graph of y = (x). 2. 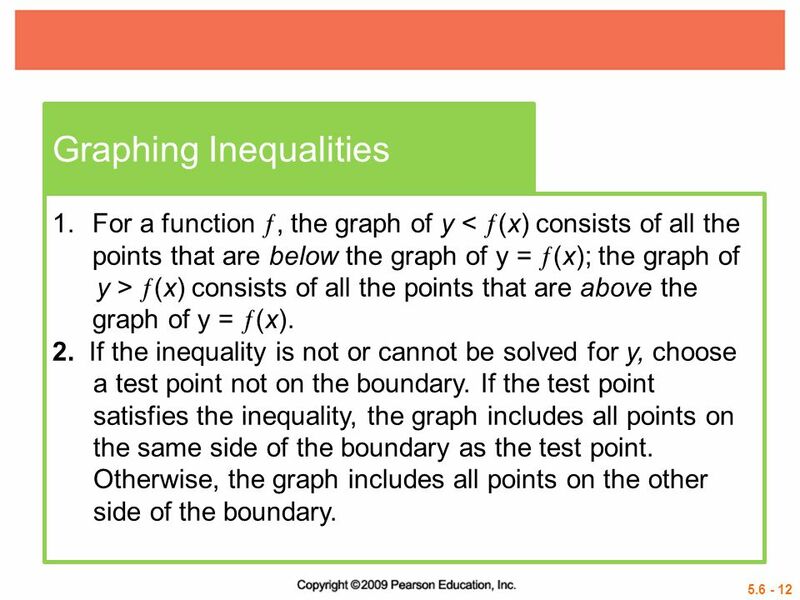 If the inequality is not or cannot be solved for y, choose a test point not on the boundary. 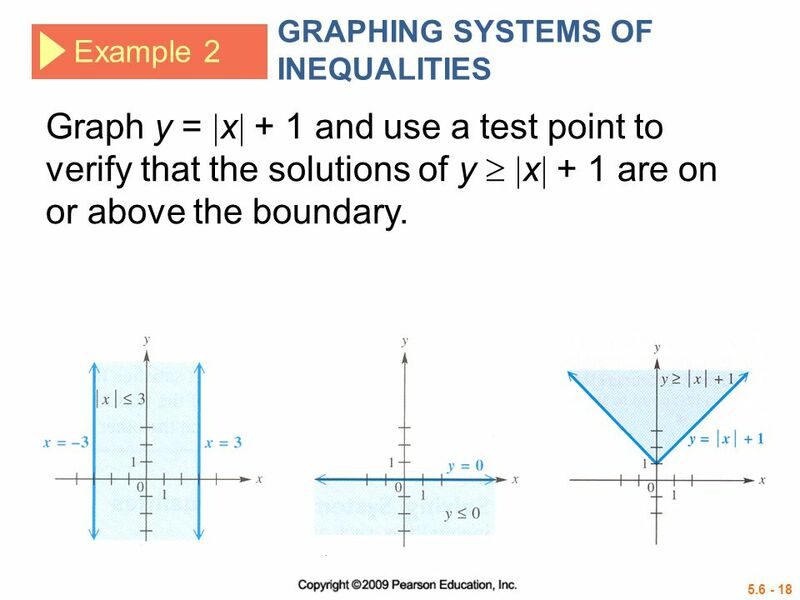 If the test point satisfies the inequality, the graph includes all points on the same side of the boundary as the test point. Otherwise, the graph includes all points on the other side of the boundary. 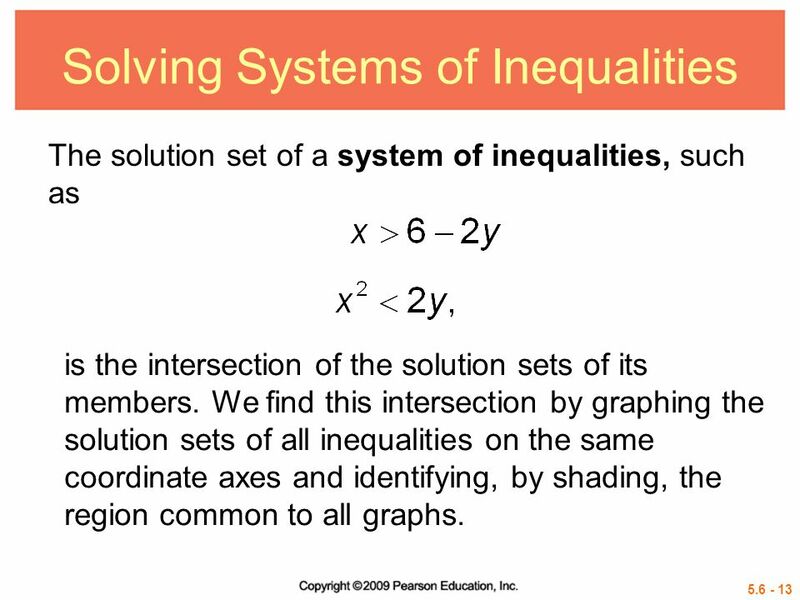 The solution set of a system of inequalities, such as is the intersection of the solution sets of its members. We find this intersection by graphing the solution sets of all inequalities on the same coordinate axes and identifying, by shading, the region common to all graphs. 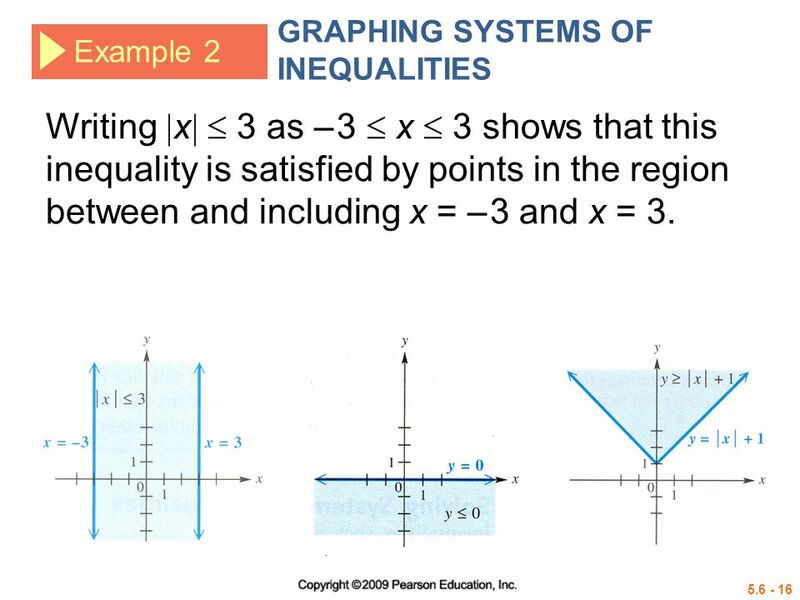 Example 2 Writing x  3 as – 3  x  3 shows that this inequality is satisfied by points in the region between and including x = – 3 and x = 3. 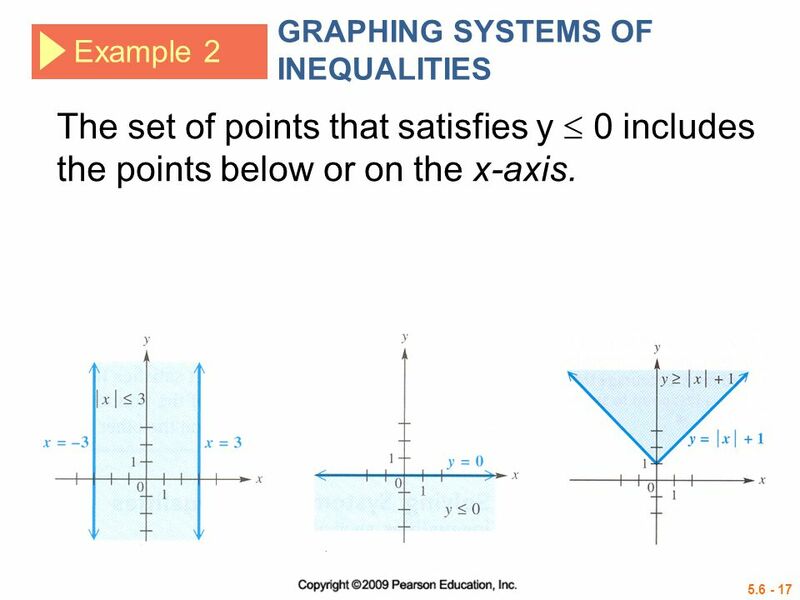 Example 2 The set of points that satisfies y  0 includes the points below or on the x-axis. Example 2 Graph y = x + 1 and use a test point to verify that the solutions of y  x + 1 are on or above the boundary. Example 2 Since the solution sets of y  0 and y  x +1 have no points in common, the solution set of the system is ø. The solution set of the system is ø, because there are no points common to all three regions. we usually give only a final graph showing the solution set of the system. 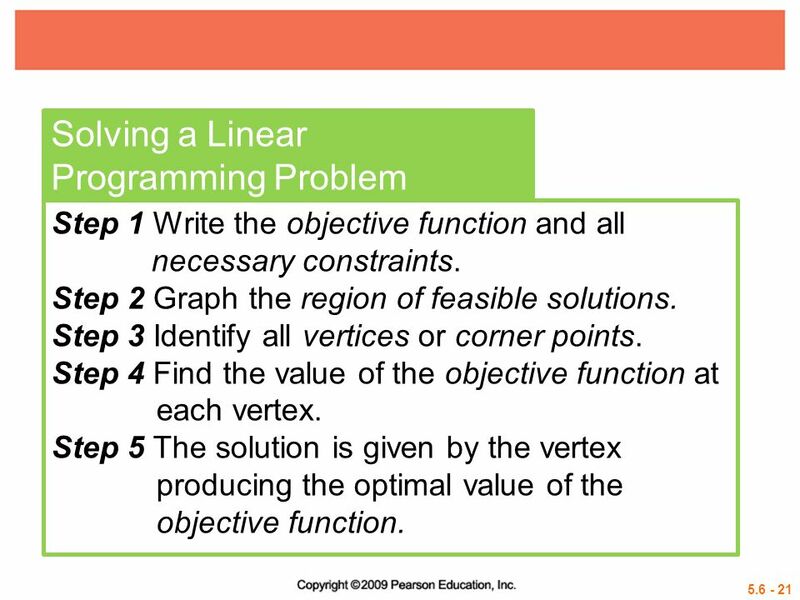 Step 1 Write the objective function and all necessary constraints. 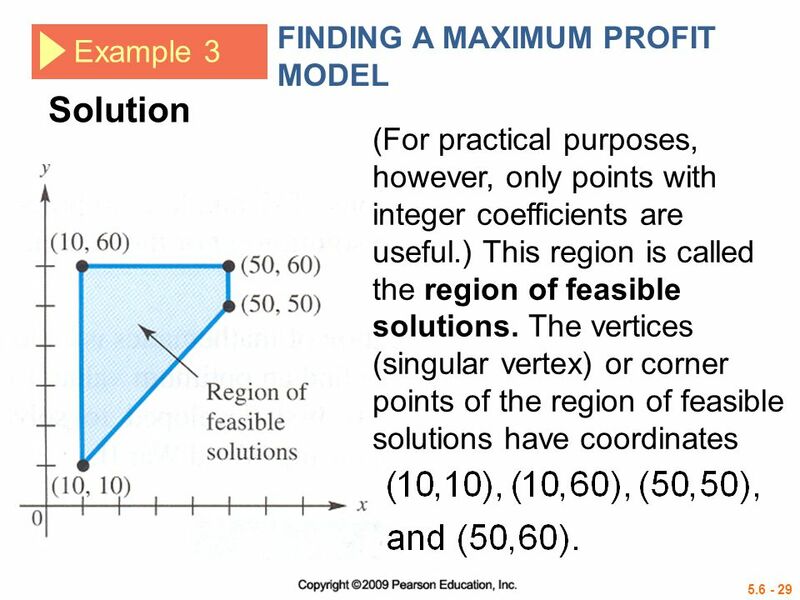 Step 2 Graph the region of feasible solutions. Step 3 Identify all vertices or corner points. Step 4 Find the value of the objective function at each vertex. 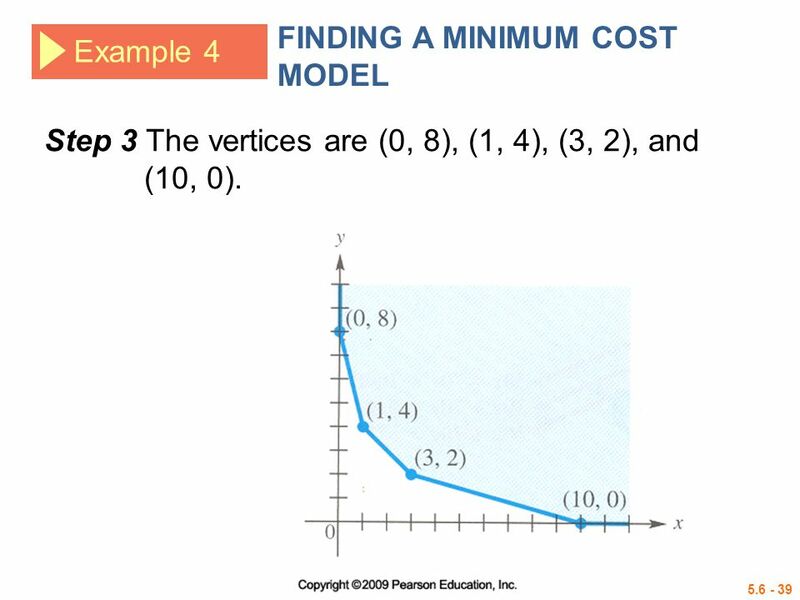 Step 5 The solution is given by the vertex producing the optimal value of the objective function. 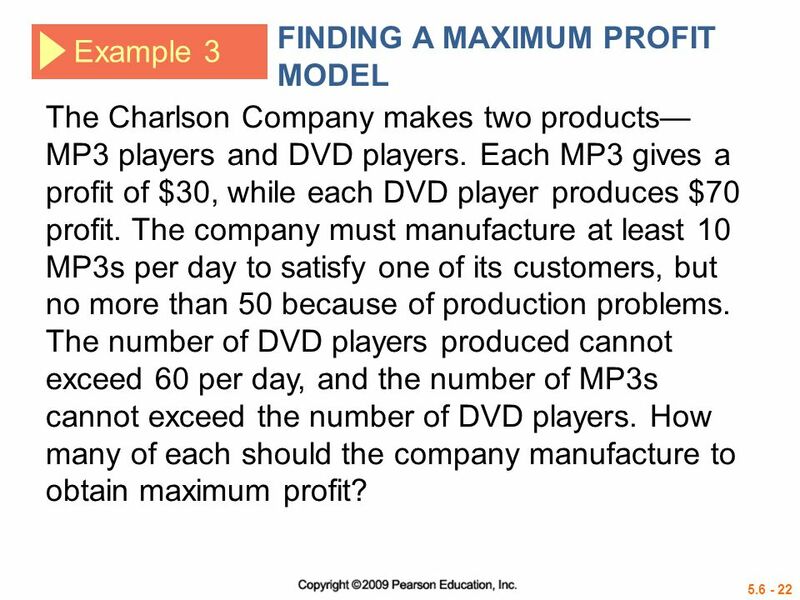 Example 3 The Charlson Company makes two products—MP3 players and DVD players. 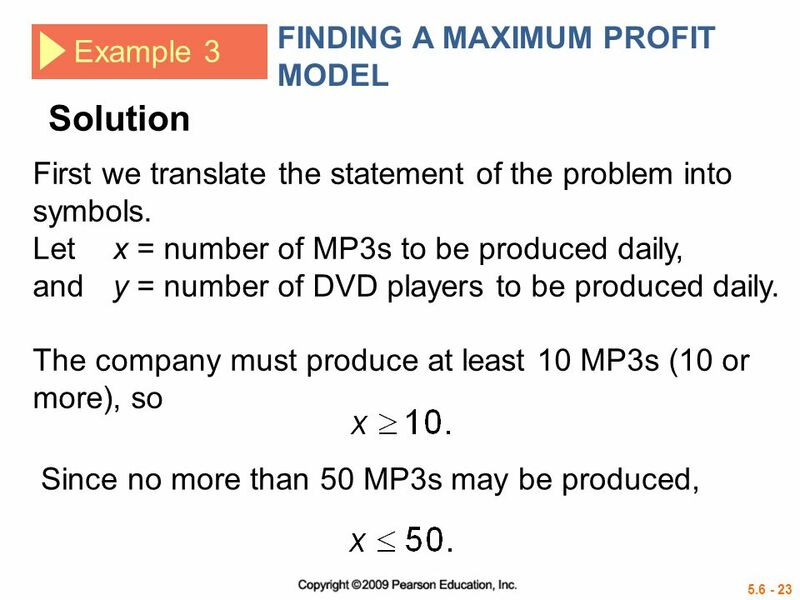 Each MP3 gives a profit of $30, while each DVD player produces $70 profit. The company must manufacture at least 10 MP3s per day to satisfy one of its customers, but no more than 50 because of production problems. 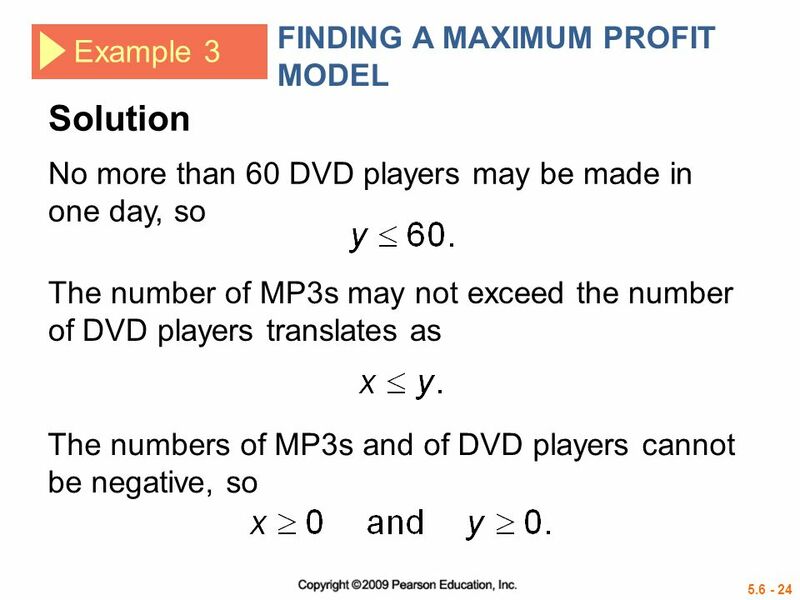 The number of DVD players produced cannot exceed 60 per day, and the number of MP3s cannot exceed the number of DVD players. How many of each should the company manufacture to obtain maximum profit? 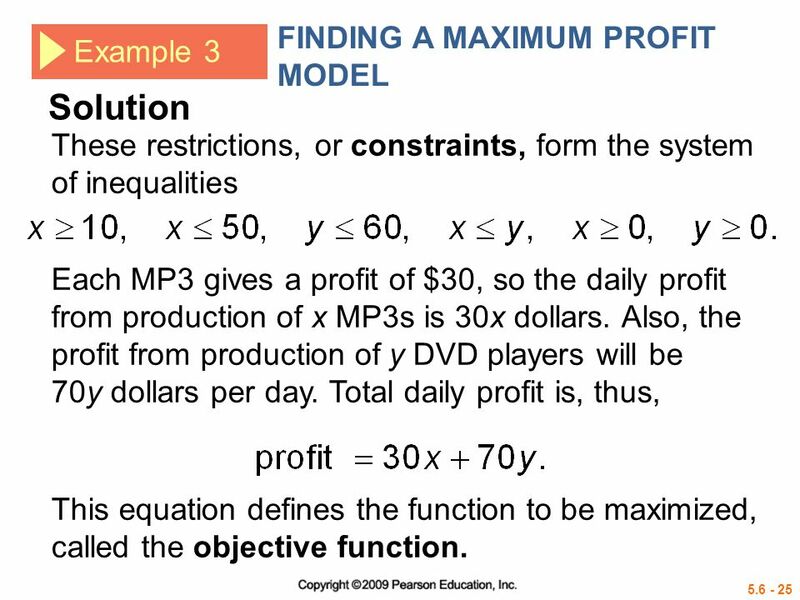 These restrictions, or constraints, form the system of inequalities Each MP3 gives a profit of $30, so the daily profit from production of x MP3s is 30x dollars. Also, the profit from production of y DVD players will be 70y dollars per day. 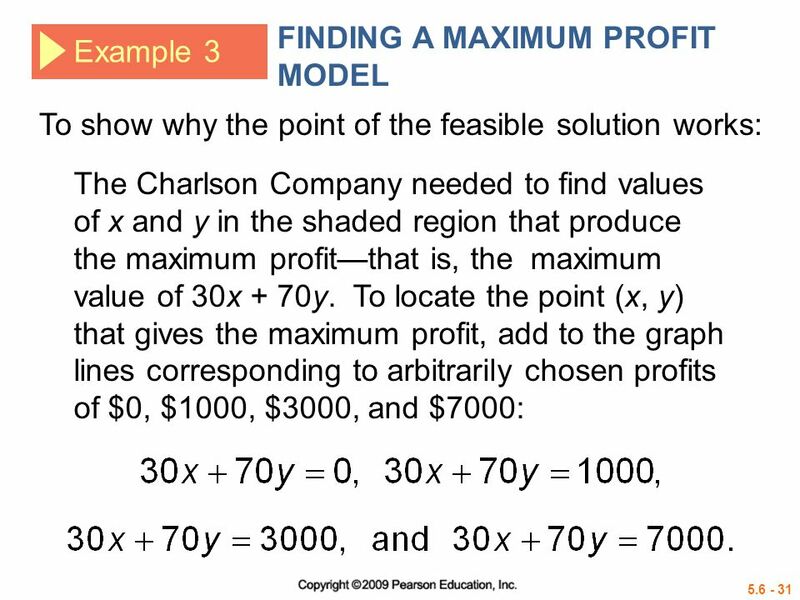 Total daily profit is, thus, This equation defines the function to be maximized, called the objective function. 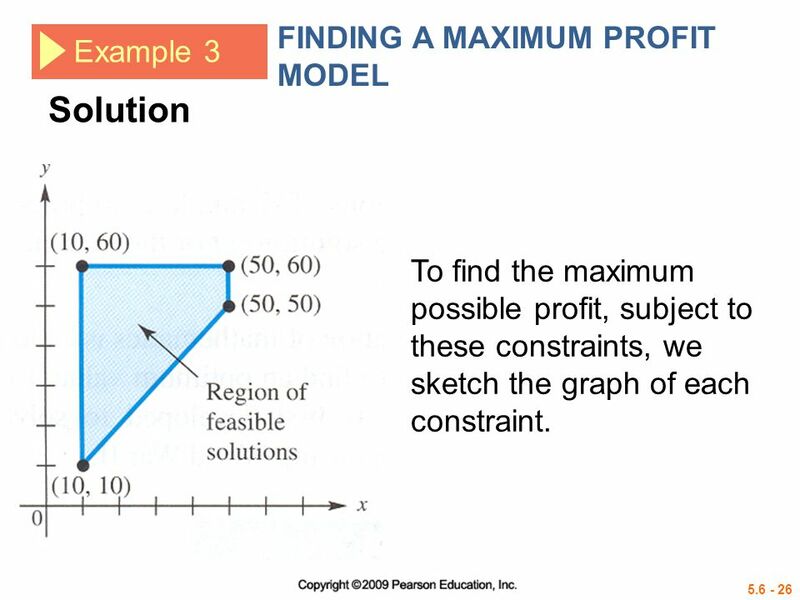 To find the maximum possible profit, subject to these constraints, we sketch the graph of each constraint. 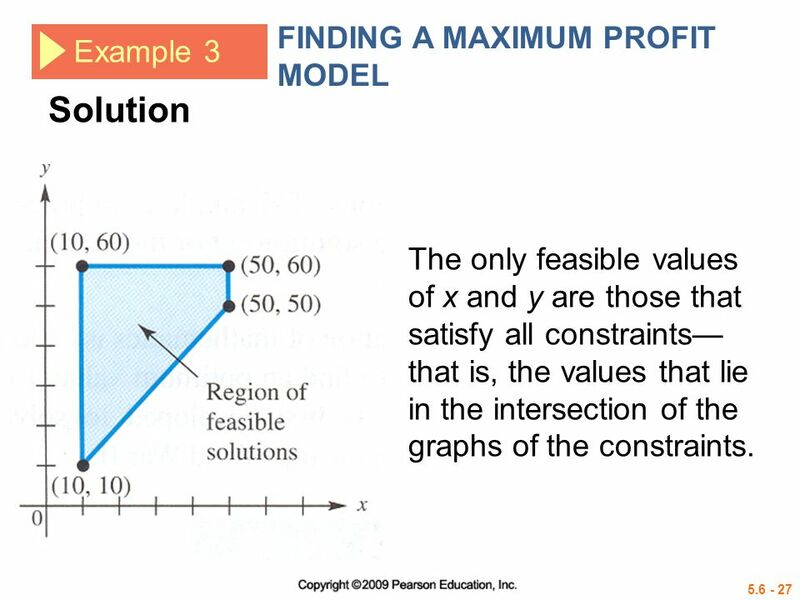 The only feasible values of x and y are those that satisfy all constraints—that is, the values that lie in the intersection of the graphs of the constraints. 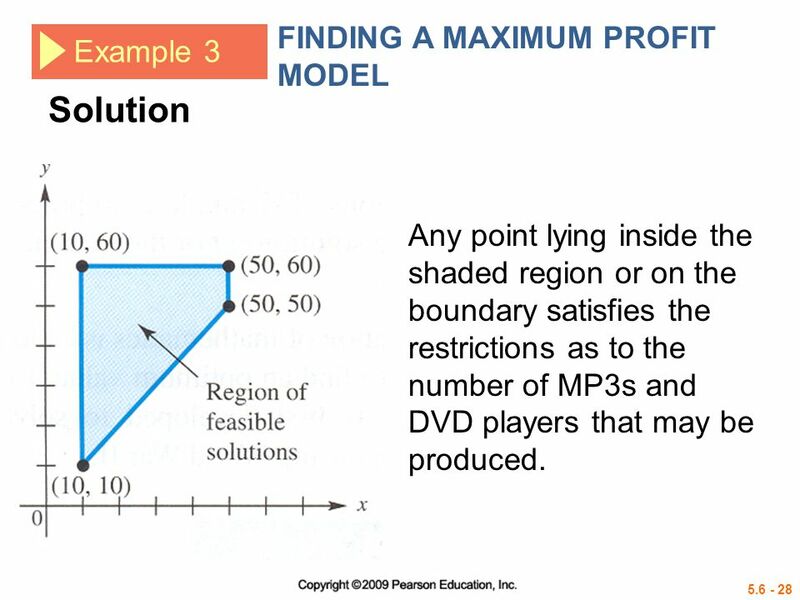 Any point lying inside the shaded region or on the boundary satisfies the restrictions as to the number of MP3s and DVD players that may be produced. We must find the value of the objective function 30x + 70y for each vertex. 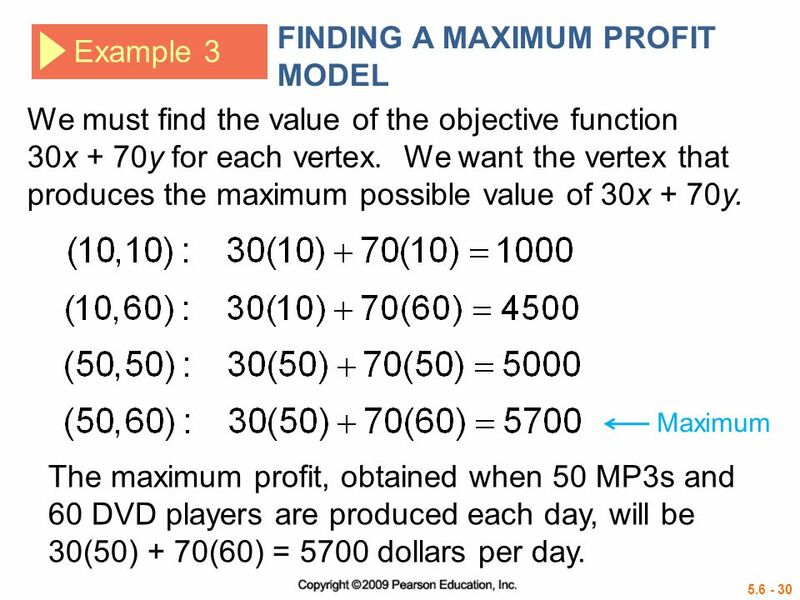 We want the vertex that produces the maximum possible value of 30x + 70y. Maximum The maximum profit, obtained when 50 MP3s and 60 DVD players are produced each day, will be 30(50) + 70(60) = 5700 dollars per day. 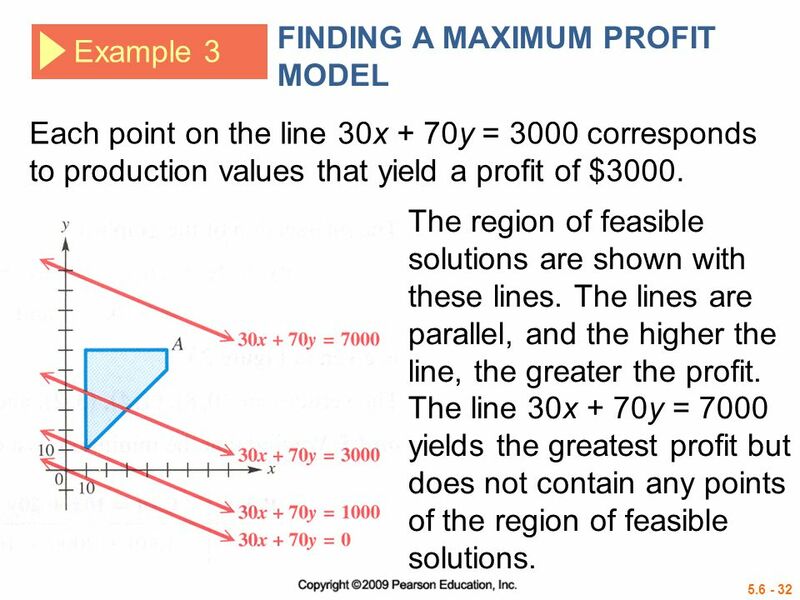 Example 3 Each point on the line 30x + 70y = 3000 corresponds to production values that yield a profit of $3000. The region of feasible solutions are shown with these lines. The lines are parallel, and the higher the line, the greater the profit. The line 30x + 70y = 7000 yields the greatest profit but does not contain any points of the region of feasible solutions. 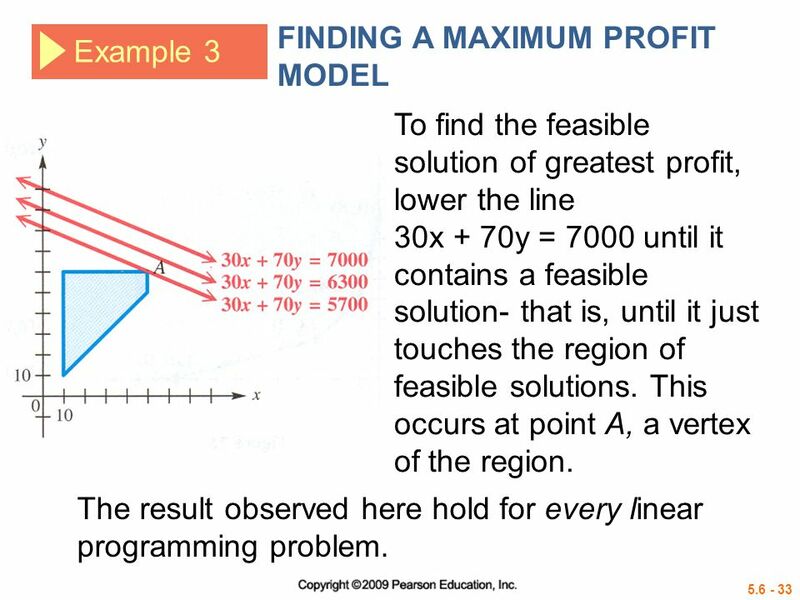 Example 3 To find the feasible solution of greatest profit, lower the line 30x + 70y = 7000 until it contains a feasible solution- that is, until it just touches the region of feasible solutions. This occurs at point A, a vertex of the region. The result observed here hold for every linear programming problem. 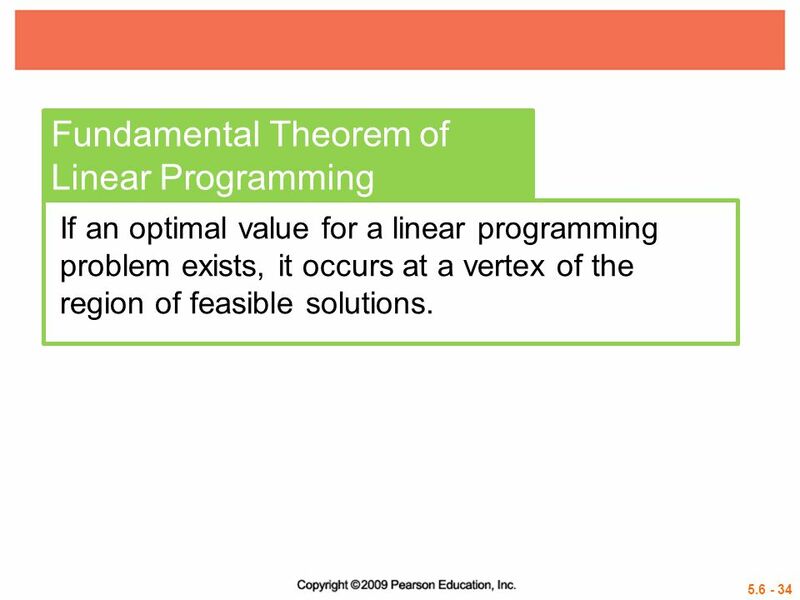 If an optimal value for a linear programming problem exists, it occurs at a vertex of the region of feasible solutions. 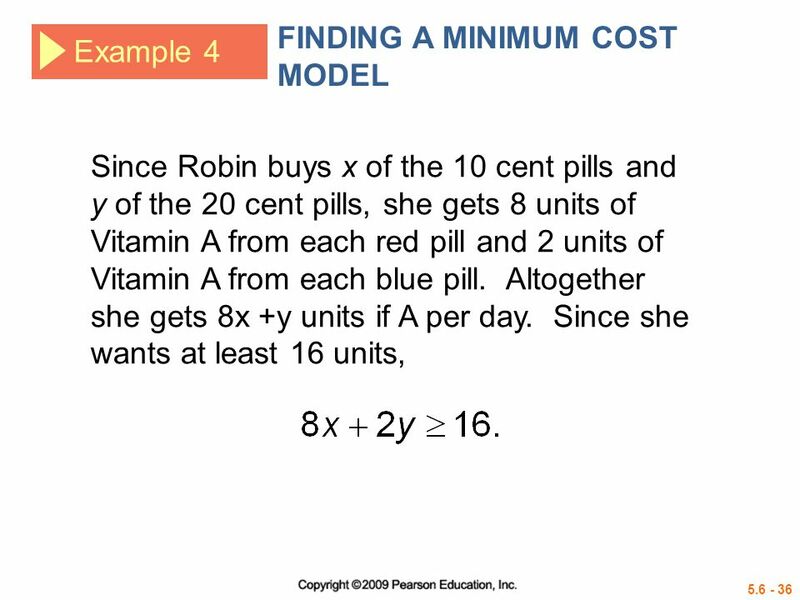 Example 4 Robin takes vitamin pills each day. 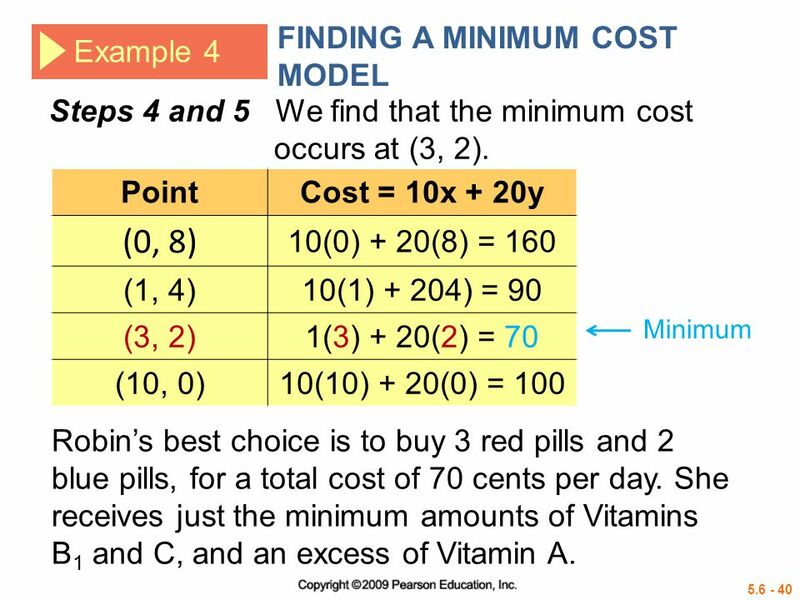 She wants at least 16 units of Vitamin A, at least 5 units of Vitamin B1 and at least 20 units of Vitamin C. She can choose between red pills, costing 10 cents each, that contain 8 units of A, 1 of B1 and 2 of C; and blue pills, costing 20 cents each, that contain 2 units of A, 1 of B1 and 7 of C. How many of each pill should she buy to minimize her cost and yet fulfill her daily requirements? Example 4 Each red pill and each blue pill supplies 1 unit of Vitamin B1. 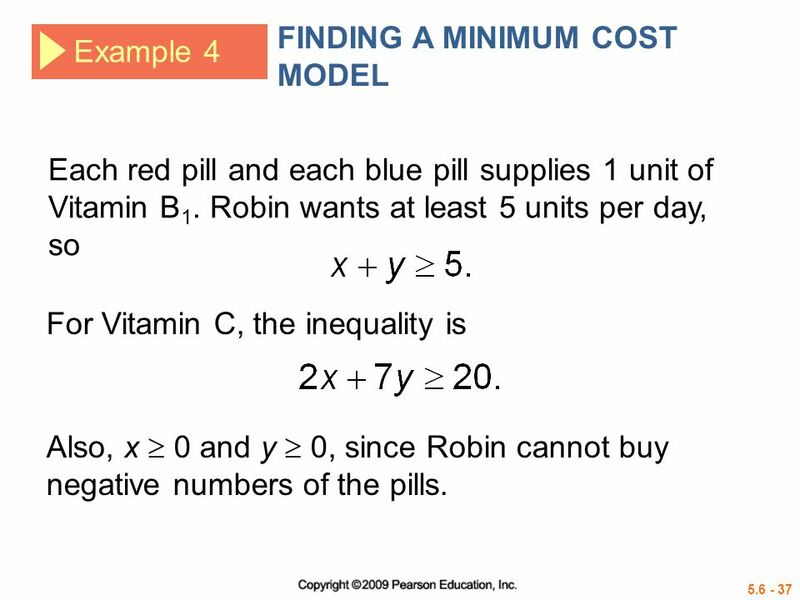 Robin wants at least 5 units per day, so For Vitamin C, the inequality is Also, x  0 and y  0, since Robin cannot buy negative numbers of the pills. Example 4 Step 3 The vertices are (0, 8), (1, 4), (3, 2), and (10, 0). 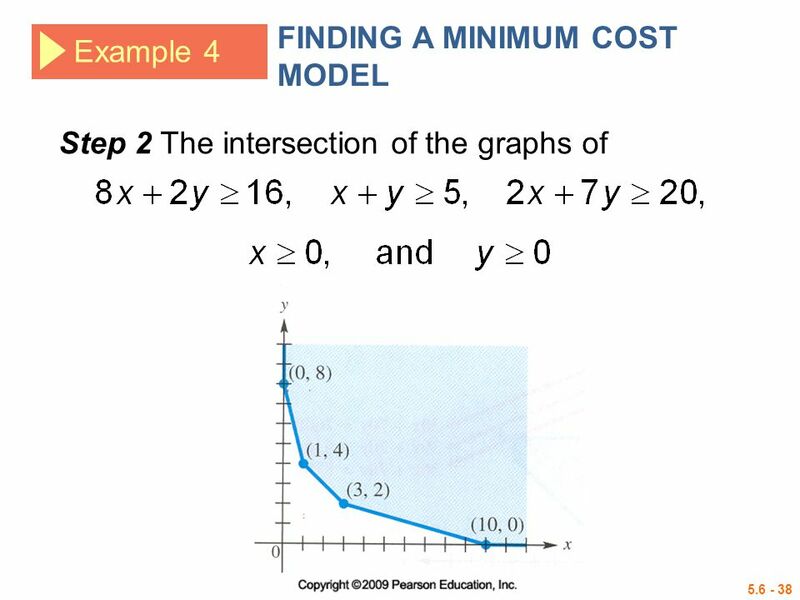 Steps 4 and 5 We find that the minimum cost occurs at (3, 2). Point Cost = 10x + 20y (0, 8) 10(0) + 20(8) = 160 (1, 4) 10(1) + 204) = 90 (3, 2) 1(3) + 20(2) = 70 (10, 0) 10(10) + 20(0) = 100 Minimum Robin’s best choice is to buy 3 red pills and 2 blue pills, for a total cost of 70 cents per day. 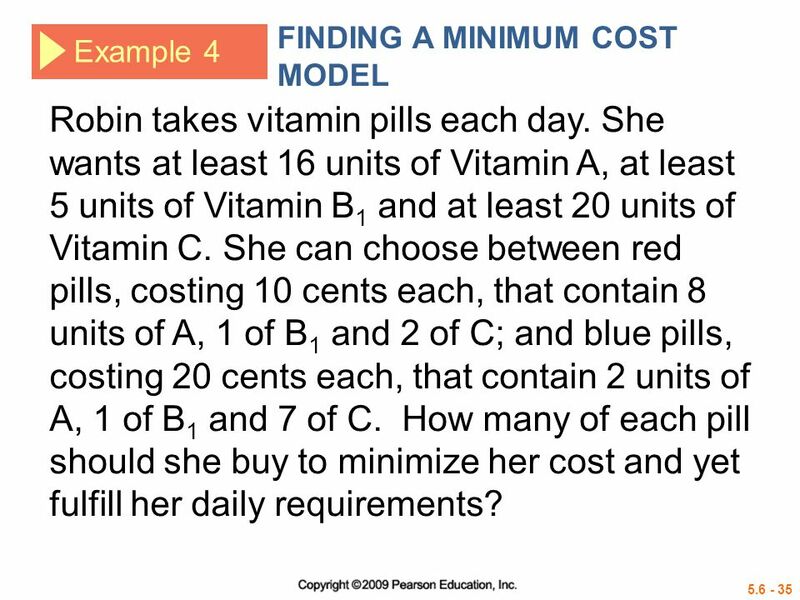 She receives just the minimum amounts of Vitamins B1 and C, and an excess of Vitamin A.
Download ppt "LIAL HORNSBY SCHNEIDER"
Introduction Solving a linear inequality in two variables is similar to graphing a linear equation, with a few extra steps that will be explained on the. CHAPTER 3 Graphs of Liner Equations Slide 2Copyright 2011, 2007, 2003, 1999 Pearson Education, Inc. 3.1Graphs and Applications of Linear Equations 3.2More. 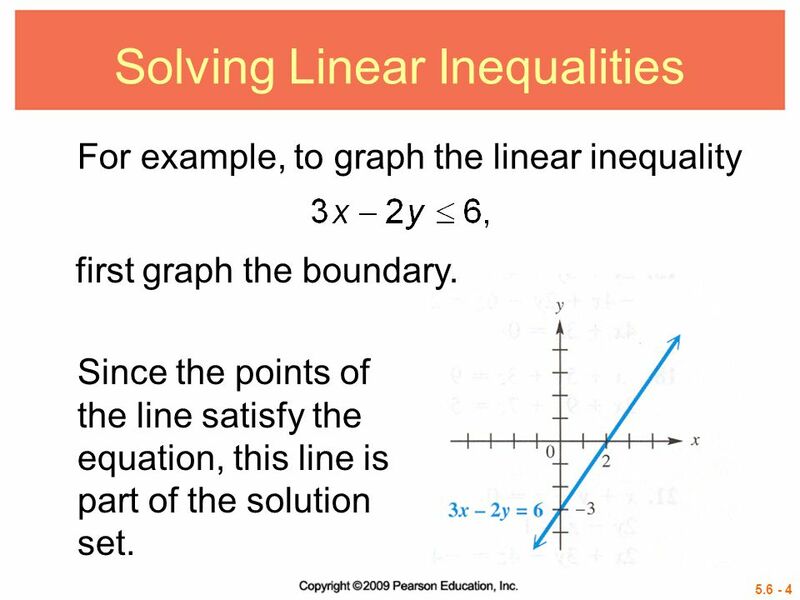 Introduction Finding the solutions to a system of linear equations requires graphing multiple linear inequalities on the same coordinate plane. Most real-world. 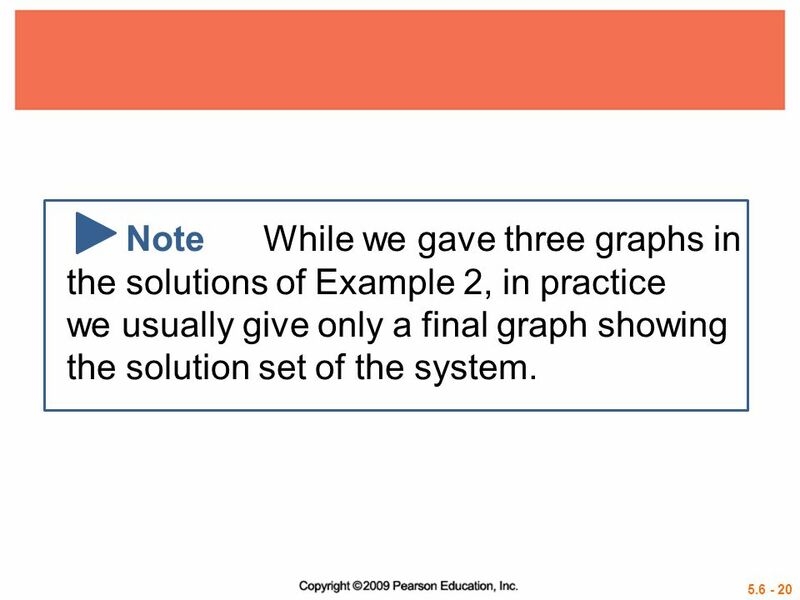 5.2 Linear Programming in two dimensions: a geometric approach In this section, we will explore applications which utilize the graph of a system of linear. Algebra I 6.0 Students graph a linear equation and compute the x- and y-intercepts. They are also able to sketch the region defined by linear inequality. 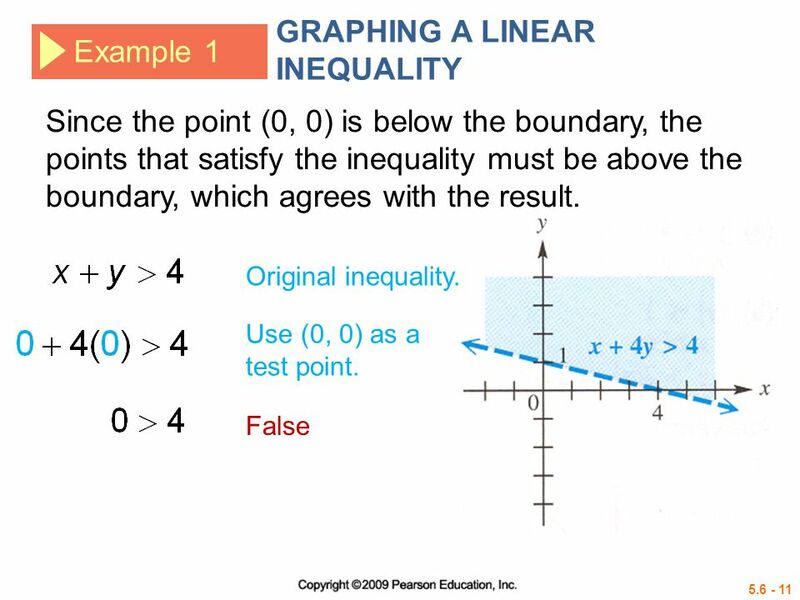 § 4.4 Linear Inequalities in Two Variables. 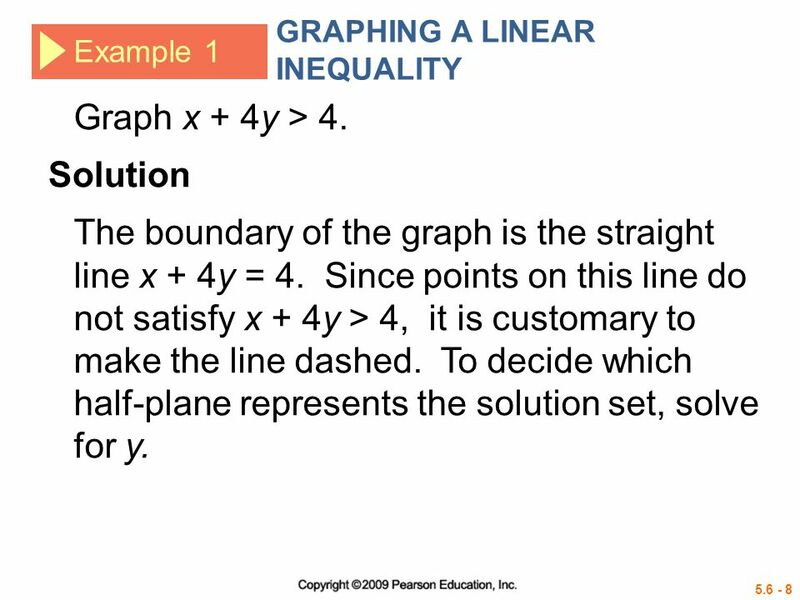 Blitzer, Intermediate Algebra, 5e – Slide #2 Section 4.4 Linear Inequalities in Two Variables Let’s consider. 6  Graphing Systems of Linear Inequalities in Two Variables  Linear Programming Problems  Graphical Solutions of Linear Programming Problems  The Simplex. 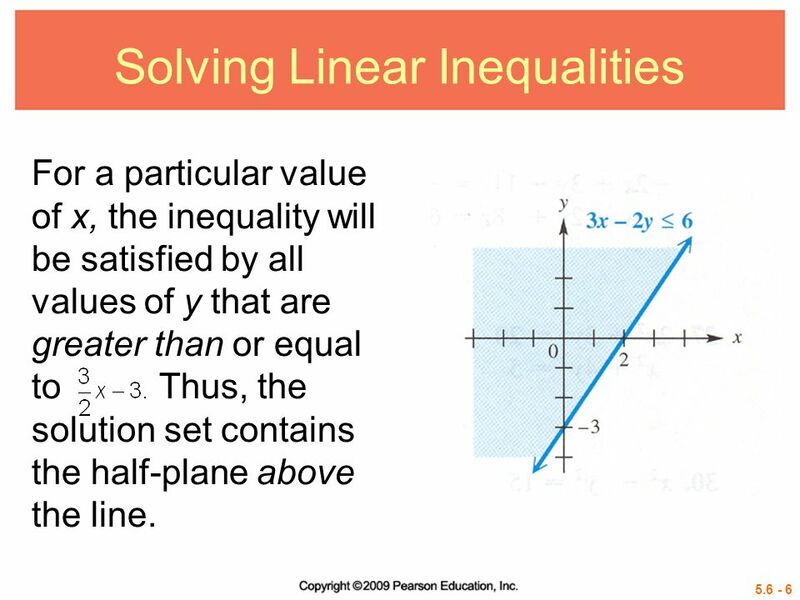 Solving Linear Inequalities in Two Variables Adapted from Walch Education. 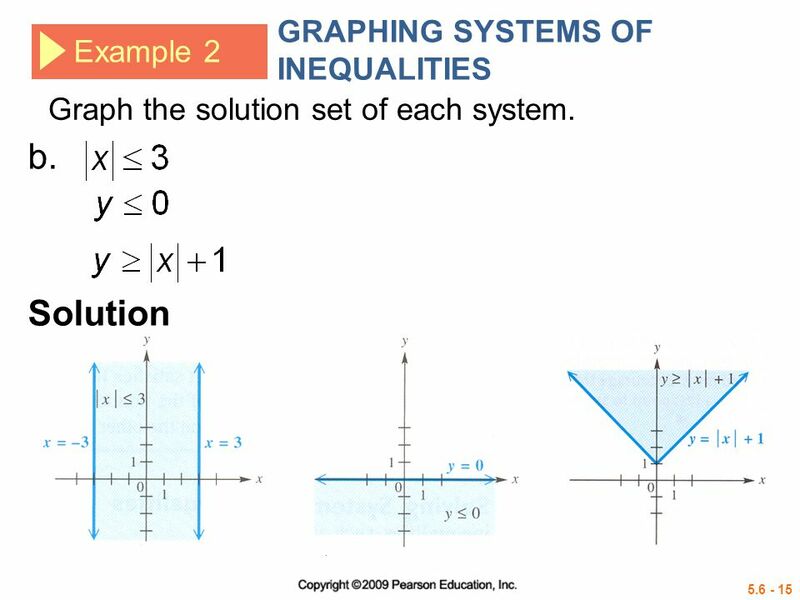 Graphing a Linear Inequality in Two Variables Replace the inequality symbol with an equal sign and graph the corresponding linear equation. Draw a solid. 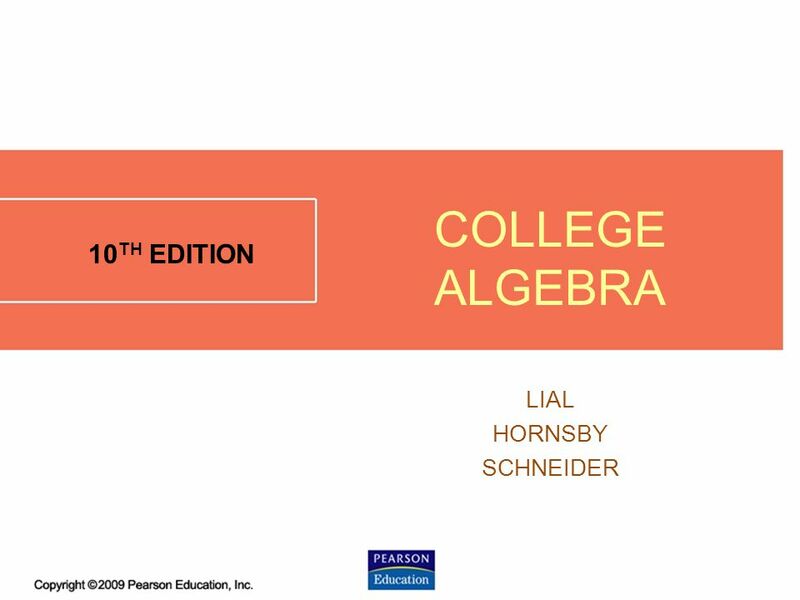 College Algebra Fifth Edition James Stewart Lothar Redlin Saleem Watson. 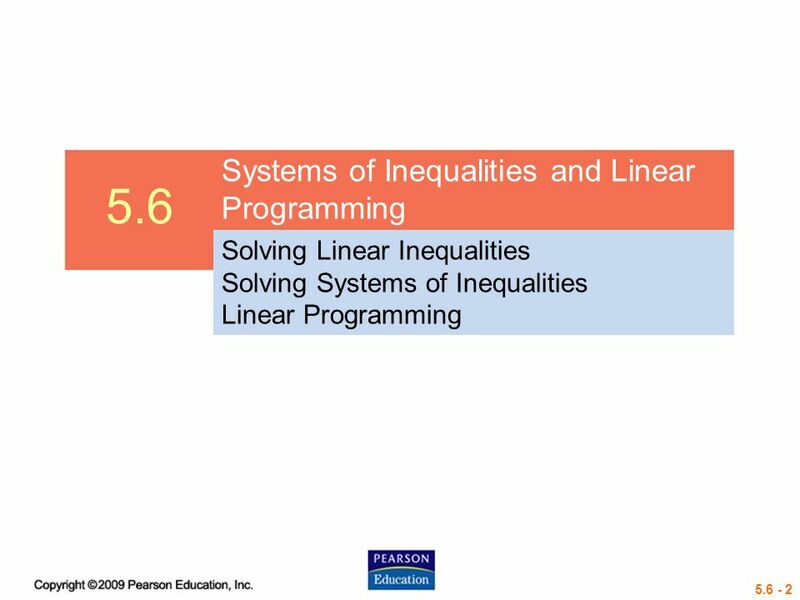 Chapter 5 Linear Inequalities and Linear Programming Section 1 Linear Inequalities in Two Variables.